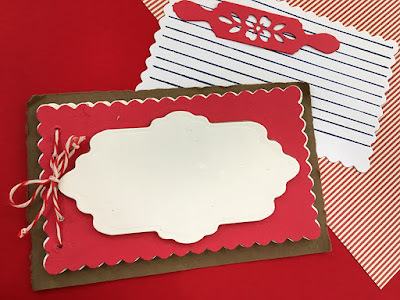 This is a special blog hop post for Spellbinders Paper Arts... after this feature you can hop over to another blog for more paper crafting fun if you’d like. As soon as the weather changes I start thinking of autumn and winter fun. But it's only fun if you plan ahead so there's no last minute time crunch. Luckily my new Sweet Christmas crafting dies are just out from Spellbinders Paper Arts! For me, the heart of the celebrations revolve around shared food, especially cookies. My grandma used to say cookies are made of butter and love. I agree and celebrate with plenty of both! First up: invitations for the annual Christmas Cookie Exchange. I love to keep it simple so I used the Love & Cookies die for the main image, adding a strip of decorative paper and a swash of striped washi tape. True confession: I adore the recipe card set. I'm using it for everything this year. It will be tucked into the vellum envelope to make the envelope just that much fancier. If you come for the Christmas Cookie Exchange you'll get a little booklet like this with the recipes for everyone's cookie contributions and a box for taking home your cookies. I did the recipe booklet mock up two ways... which one should I use to bind the recipes together? Or both? As always, each friend will go home with a lovely box of delicious festive cookies! I'm using the gingerbread boy die to make decorated boxes so everyone will go home with a special container. You can order your dies here if you'd like these Sweet Christmas crafting dies. And more! Oh cool idea for the cookie exchange. I love the creativity here. Love the timeless feel of your designs! I haven't done a cookie exchange in years but they are such fun. You've done an excellent job creating festive party decor! Love the new sets. I think I've only been to one cookie exchange in my life. What fun it would be to do one. 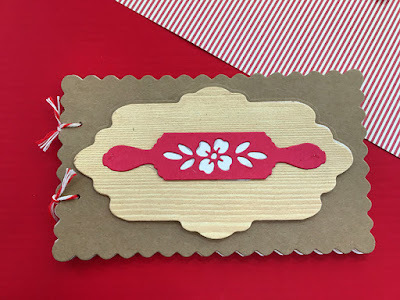 Lovely invitations for the cookie exchange! 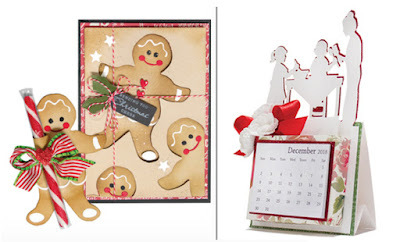 Your cookie exchange will certainly be a big hit with all of your crafty creations! Love these dies. Awesome cards and projects! That gingerbread is my favorite. So adorable! Love the recipe booklet. Such cute gift ideas. What a great idea! Very nice. What a cute cookie exchange. I like the second way to hand out the recipes. You could put a title and date of the exchange on the outside. Very cute!!! What a great idea for a cookie exchange! I love the bright colors you used! That gingerbread man is so cute! Love the mini album. I like the binding with the bow on top. Cute gingerbread card. What a great idea to make boxes up early for cookie exchanges. I want to come to your Christmas Cookie Exchange! What great projects; sure to make your event a standout. 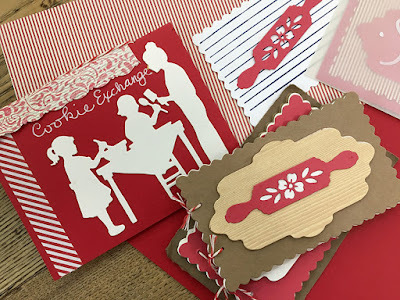 Love the Cookie Exchange idea and the gingerbread card and such cute recipe card! Ooo, I can’t wait to order my baking dies! I absolutely love them!! I love to bake all year round but especially at the holidays. These cards and dies are my very favorite! I love how you “tied” it all together with baking twine. This is an awesome holiday set of dies, Sharyn! I love to bake, especially at the holidays, and host a very large cookie exchange luncheon every year. You can bet I am going to use some of your ideas to make this year's exchange the very best yet! I love the details you added to your projects here! They are all so special! the family baking together is fantastic. So very pretty. Love all of them. Thank you for sharing. I love the new silhouette dies. I have several of your previous collections. They make beautiful cards and embellishments for my scrapbooks. What fun projects!!! Thank you for sharing your talent and inspiration with all of us!! Your cookie exchange sound like fun. Love this idea!! Oh Sharyn, what cute cute cards. I love the gingerbread man as it brings back so many happy days baking with friends and cooking for hours on end. All the baking dies remind me of everything we used and with recipes cards on hand. Now I bake with daughters and granddaughter and what fun. I just adore the rolling pin with flowers!! Fantastic new dies! Love the SWEET theme! Those silhouette images are amazing... lovely samples. The cookie exchange invitation is so pretty! Love your new dies Sharon. The cookie exchange is wonderful. I am a big fan of gingerbread. Nicely done. Wonderful projects. I love the silhouettes, and the gingerbread man is adorable. 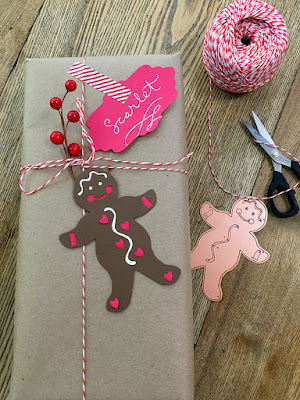 What a cute idea and great for your cookie exchange - so warm and cozy, I really enjoy great packaging ideas! Your dies are really fun to work with, the rolling pin is my favorite! Love the projects you made with these dies. Cookie exchange is a terrific idea. I love all of your products, but I am in love with the silhouette calendar topper!! 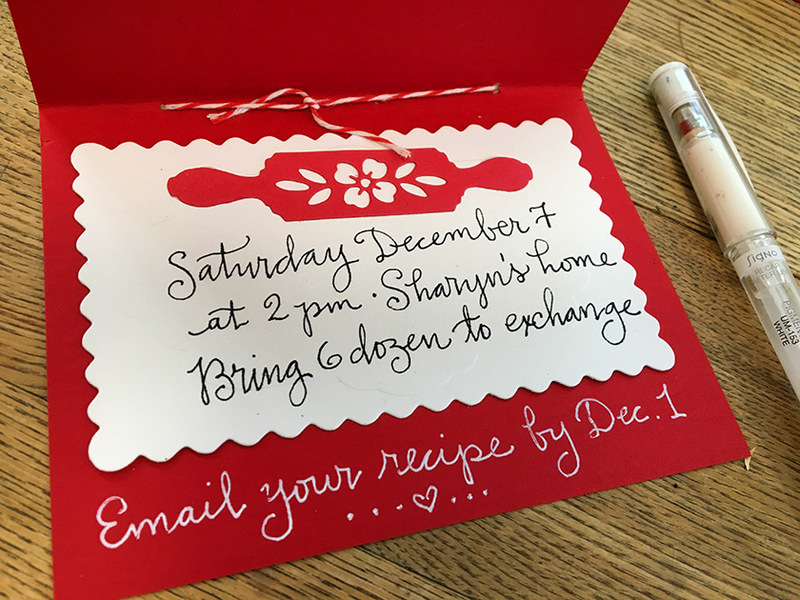 The cookie exchange invitation is a great idea too! Beautiful projects, great cookie exchange idea. Such great projects, they're awesome. I love how you put together the whole package for each person, what a great way to spice up the cookie exchange! I absolutely love these dies. I can already envision all the projects I'm going to be making. Thank you! I will certainly be ordering these dies. Thank you! Love the cookie exchange card! Such a sweet little gingerbread man. Love it. I want to participate in your Cookie Exchange lol, I love all that you've created for it. I'm thinking both recipe books, they are both perfect :) You've don a fantastic job of showcasing this set and that little Gingerbread boy....just adorable. LOve the box, so pretty. The recipe cards also lovely. Always nice to be ahead of the game. Have a great holiday season! So many cute ideas! 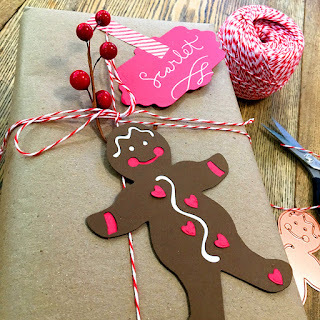 I love the idea of making gingerbread man tags. so fun!! 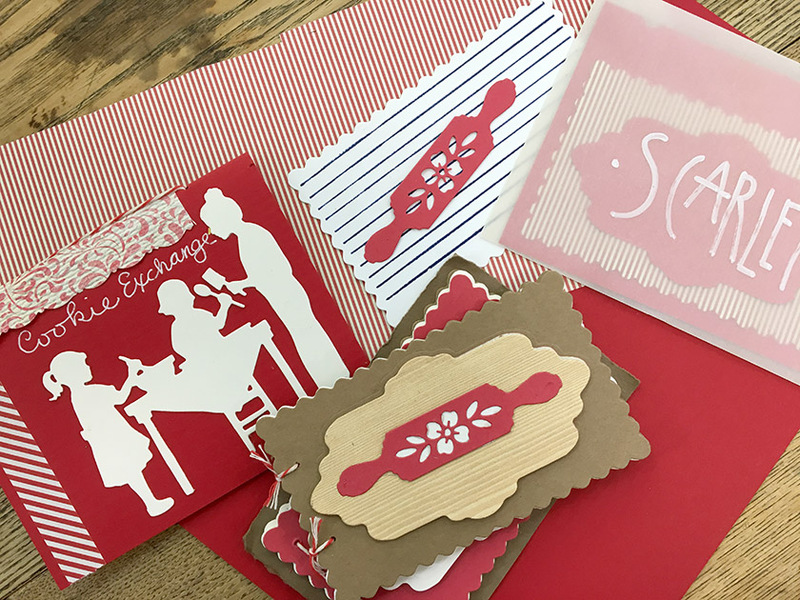 These cards do capture the concept of family, home and what we do most at the holidays which is baking good things to eat. You did an awesome job on all your projects. Thanks for sharing. The cookie exchange invites are gorgeous. What a great idea! Your fabulous projects are the essence of the holidays! Beautifully done! The little recipe booklet is a great dea. Fun! Your projects are lovely and the recipe booklet is a great idea. 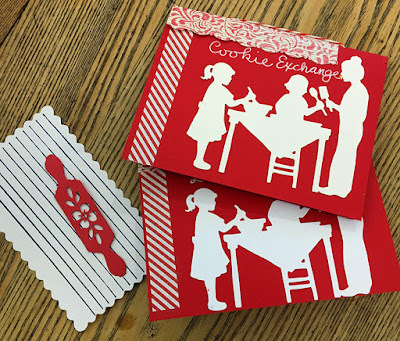 I love the idea of the recipe booklet for your Cookie Exchange. Wish I could be a participant. A truly lovely plan for a cookie exchange! The recipe booklet is a great idea. I think I like the single thread enclosure, but whichever one opens easiest would be my choice. These dies are the perfect design elements to pull it all together. TFS. The cookie exchange is a delightful way to use these sets! Great job...thanks for sharing! I think you should make both styles of the recipe book because I can't choose they are both so cute!!! Always a great idea to start ahead so the time crunch is not so bad. My Mom taught me that! Great release! The recipe cards are awesome! I bake a lot of gifts for the holidays, these would go great!! I love to bake during the holidays too! Thanks for sharing your projects and inspiration! I was just thinking that, and then you did it but your inspiration is so gorgeous!! Am saving this for my next cookie exchange! Great inspiration! 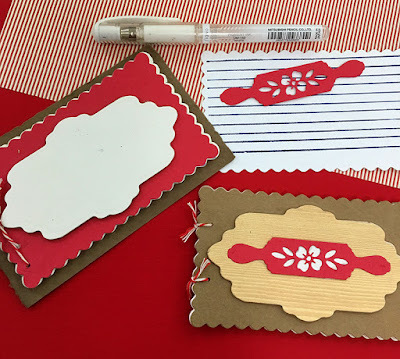 I love that rolling pin with the cutouts, and your recipe booklet idea is such a good one! The cookie exchange with the recipe booklet is a wonderful idea! Oh my! These dies are absolutely perfect for my holiday gift giving of candy and cookies. This collection is really great. And I love the cute gingerbread boy. The Let's Bake set is also a great addition to the stash. Oh what fantastic projects! So creative to create tags, recipe cards and gift packaging for a cookie exchange. So very creative and pretty! What a cute way to announce a cookie exchange party! And I love the box decorating you did for each guest! That Gingerbread Man is just adorable! You have given me so many new uses for the dies and to use love of cooking and my dies - Heaven! Love the gingerbread; my favorite! Thank you for the new inspiration and for sharing project with us!